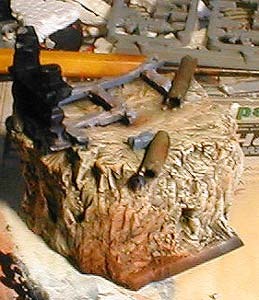 The Marines, eventually, would look something like below and would be duelling on a big rock, amidst a ruined building. The Dark Angel would be positioned leaping forwards, grasping the pistol hand of the fallen, who is slipping backwards in mud, about to fall off the side. 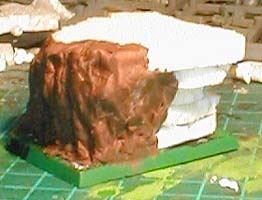 I then further added spots of Bestial Brown over the rock to dirty it up a little, and a splash of brown also down the corner below the pipe, where the runoff would be. 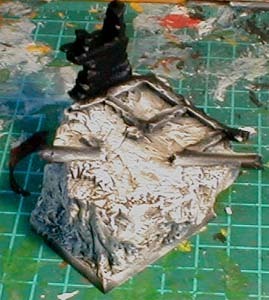 The pipes are painted with TinBitz and Beaten Copper, spotted with Goblin Green. This would have been my entry for the 2002 Australian Golden Demons contest. Due to unforeseen circumstances, however, I not only didn't get it finished, I wasn't able to make it to GD either. The entry is a duel, between a Dark Angel and a Fallen Angel. 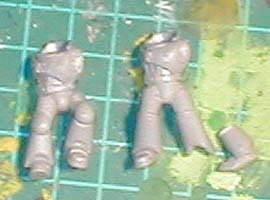 I wanted something fairly uncomplicated, due to time constraints, and the Space Marine plastics lend themselves well to easy conversions. I also wanted something other than the standard "two models looking fiercely at each other", which is what most duel entries seem to be. The next step was to start building up the detail on the top with the remains of a ruined building and lots of mud in order to asssemble the two spacemarines around it. 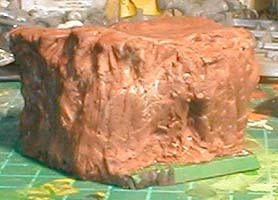 The base takes shape. 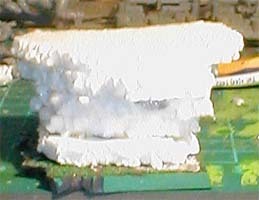 (Stage 1D) The pipe was made from a section of plastic tubing from an aircraft kit. 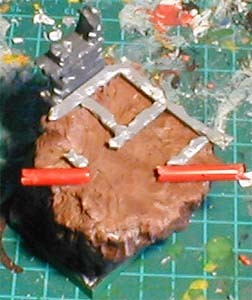 I cut up pieces of sprue to make the grey squares which will be be the mounting for the floor tiles. The wall section is made from a piece cut off from one of GW's ruined building sections. 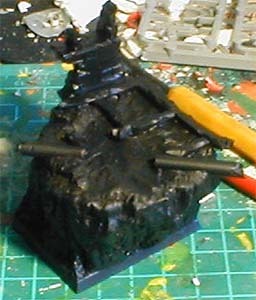 Then came the black undercoating, (Stage 1E) followed by a heavy drybrush of Bleached Bone, and then a highlight of Skull White. (Stage 1F) You may wonder as to why I am dry brushing for a GD entry. 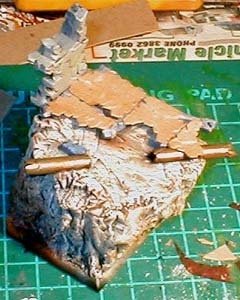 Well, I think drybrushing is the best way to get a natural rock texture. It takes a bit of patience to do it right, but the end result is worth it. Finally, the pipes and floor support are painted.